The Steller's sea cow went extinct only 27 years after being discovered in the North Pacific in 1741. 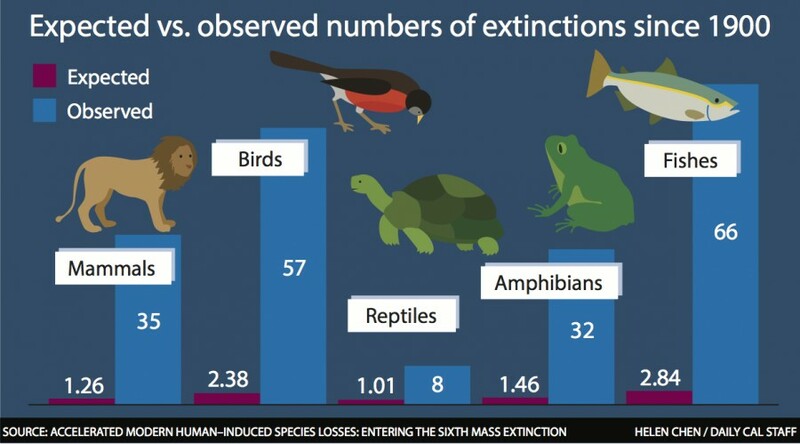 It acts as an example of modern species extinction caused by human-related activities. Co-author Anthony Barnosky, a campus professor of integrative biology, cited a high per-capita use of fossil fuels and the over-exploitation of ecosystems for economic gain as major contributing factors. “In one or two human lifetimes, we are the ones wiping out what evolution took millions of years to create,” he said. In addition to being the driving force behind the sixth mass extinction, humans will ultimately face “high moral and aesthetic costs” in as little as three lifetimes, according to Barnosky. Crucial ecosystem services, such as crop pollination and water purification, will suffer if high rates of extinction persist, the study says. Considering that it took up to millions of years for the planet to rediversify after the previously recorded mass extinctions, the study says, these consequences would be effectively permanent on human time scales.